This past August 28th, my husband Jeff and I celebrated 25 years of marriage. 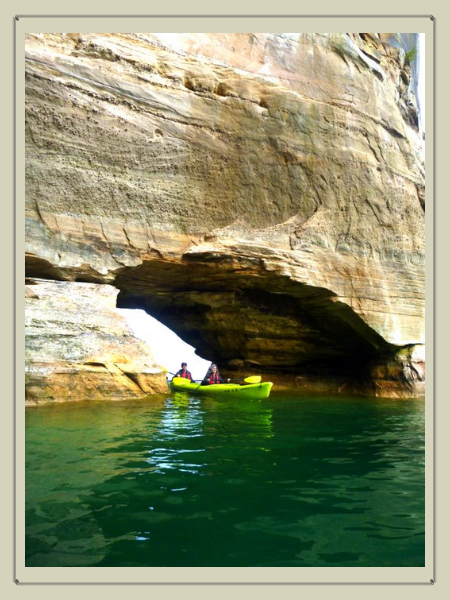 For our anniversary getaway, we were headed to Munising, Michigan to kayak along the Pictured Rocks National Lakeshore and explore other sites in the Upper Penninsula. With Jeff behind the wheel and a five hour drive ahead of us, I began contemplating how we had arrived at this milestone anniversary. In a world of marital discord, this suddenly felt like quite an accomplishment. We were introduced by mutual friends while playing billiards at a sports bar. Jeff stuck his hand out to shake mine and I said, “Hi, I’m Dianna and my hands are ice cold.” Jeff clasped my cold hands in both of his hands, looked me in the eyes and said, “That's ok, cold hands, warm heart.” And so it began. We have made it through unexpected financial burden, major career changes, a chronic illness that hijacked my body for five years and nearly killed me (but that's a topic for a future blog), serious illness (Jeff), extended family tension and major dysfunction on both sides, problems with adding to our immediate family, parenting conflicts, depression and anxiety diagnoses (me), mega stress while completing an MBA program, adopting a baby and being an involved dad to an eleven year old son and working full time plus (Jeff). I was at the point of giving up several times, but somehow being in the presence of the unflappable Jeff, I was always able to work through the difficulties, one step at a time. The 50-50 rule. We had to spend three sessions with a long-married pastor before he would marry us. At one of his teachings, he explained that it would be highly unlikely that we would evenly split up all chores, finances, errands, etc. He explained that instead of expecting a 50-50 percent split, it would be more realistic to be open to sometimes doing 75 percent while the other does 25 percent, or maybe even 99 percent to one percent. We never even had a chance to forget this lesson because within a few months of marriage, we were lopsided in percentages when I became chronically ill.
A few days before our wedding, I was working with an elderly woman who would be celebrating her 70th wedding anniversary on the day of our marriage. I asked her if she had any marital advice for me and she replied, “Marriage is not for the weak.” At the time, that seemed like a funny comment to make, but throughout the years, I often thought of it and eventually felt the truth of it. I am grateful for that realistic one-liner because on more than one occasion, it gave me hidden strength. After our son was born, my aunt told me the greatest gift I could give my baby was to love his father. Meaning that, giving each other the undivided attention we both still needed, even as we added to our family, would keep us connected as a couple. It became a cherished piece of advice that we continue to honor, even today. The science of it all is quite astonishing. Both Jeff and I have always been open to trying new activities and exploring unfamiliar locations, but little did we know, it was also healthy for our marriage. The brain pairs the person you are with and the excitement of a new event or new place. This creates a chemical release in the brain that elicits the feeling that is similar to how we feel in the beginning stages of a romantic relationship. Jeff has a keen ability to see me through rose-colored glasses, still, after all this time. There is evidence that this contributes to healthy long term marriages and I would agree wholeheartedly. Physical intimacy is an important part of marriage. Our bodies are designed to experience each other and bond deeply with our partner through physical connection. There may be changes and challenges over time, but it is worth every ounce of effort. The word 'Acceptance' may be one of the most powerful words in marriage. I have grown in my own acceptance of the word acceptance. If you are unsure of the impact it can have on your marriage, just ponder it for a day, or a month, maybe even a year, or for me, all twenty-five of them. As we crossed the Mackinac Bridge, I asked Jeff to name his favorite memories of our marriage. Several minutes passed when he asked me what my personal words of wisdom were about marriage. I pondered his question as I watched the lake. I was mesmerized by the beauty of Lake Superior, but I knew there was danger in it too. However, I was still drawn to entering the water. The shallow water was manageable, so I walked further out ready to take the plunge. Suddenly I was experiencing the shock of the frigid temperature and the crash of a wave surrounded me, pulling me down. With determination, I surrendered to it and accepted the current, letting it flow around me. Minutes later, I came out of the lake feeling stronger, energized, alive! In that moment, I realized what an accurate metaphor Lake Superior symbolized for our marriage. It is for us, My Love. Dianna is a Certified Professional Coach (CPC) through the prestigious Institute of Professional Excellence in Coaching, iPEC, an accredited program with the International Coach Federation or ICF. She is also a certified Youth and Teen Yoga and Mindfulness instructor, dedicated to bringing the practice to all ages through classes, private sessions or life coaching. Older PostHow do a Winnebago, a Spartan, Publishers Clearing House and a Teacup all relate to life coaching?